If you spent much time in Asheville over the past decade, you’ve likely seen the work of artist Scott Allred. His graphic design work and mural painting (done with business partner and fellow artist Jeremy Russell, who together form Brushcan Custom Murals) appears on everything from a local craft brewer’s beer cans to entire facades of local businesses. Allred will celebrate that work and much more during a 4 p.m. reception Saturday at Ramp Studios on Riverside Drive celebrating a new exhibition, “The Art of Design: 30 Years of Hand-Drawn Design by Scott Allred.” The renderings span more than three decades of Allred’s wide-ranging art, which includes logos, book illustrations, packaging designs, murals and more. It started with Allred’s interest in art design, which the Indiana native pursued at the Art Academy of Cincinnati. 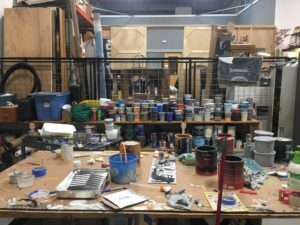 From there, he landed a job with a theme-park owner, where he was hired as a seasonal painter to create scenery for theater backdrops and draw signage for amusement parks like Carowinds and Kings Dominion. Allred’s employer was purchased by another company and relocated its headquarters to Charlotte. Allred figured he could land a full-time job with the company, so he and his wife, Robin, moved to North Carolina. Within four years, Allred was running the paint shop and overseeing about 10 employees. The company was sold again in 2002. It laid off 250 employees in one day. Painters, sewers, welders and carpenters found themselves looking for new jobs. Allred found work painting diorama backgrounds for a company that designed children’s museums, but by that time, the fast pace of Charlotte’s growth had become bothersome. Scott and Robin had a young daughter, Jane, and they started looking for a new home. Savannah and Charleston were possibilities, as was Asheville, which was familiar stop for concerts and short get-aways. 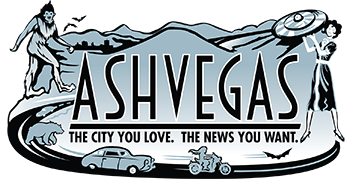 Asheville ended up being their choice. After a year of house hunting, the couple settled in. For those first few years in the mountains, most of Allred’s work was back in Charlotte. “I would get hired freelance, and then come back here and relax,” he says. In 2014, Russell and Allred formalized their partnership in Brushcan. “I think some people feel more comfortable working with a company, rather than two independent art guys. There are so many artists in town, and so many flaky artists, that when you put a name on yourself and have a company, it feels more solid,” he says. “Ever since then, we haven’t stopped working,” says Allred, noting that the local economy’s growing momentum certainly didn’t hurt. Allred and his art have ventured down many roads. He illustrated a series of children’s books for National Geographic. A long-time fan of the Grateful Dead, he used to design his own concert T-shirts and sell them in parking lots. 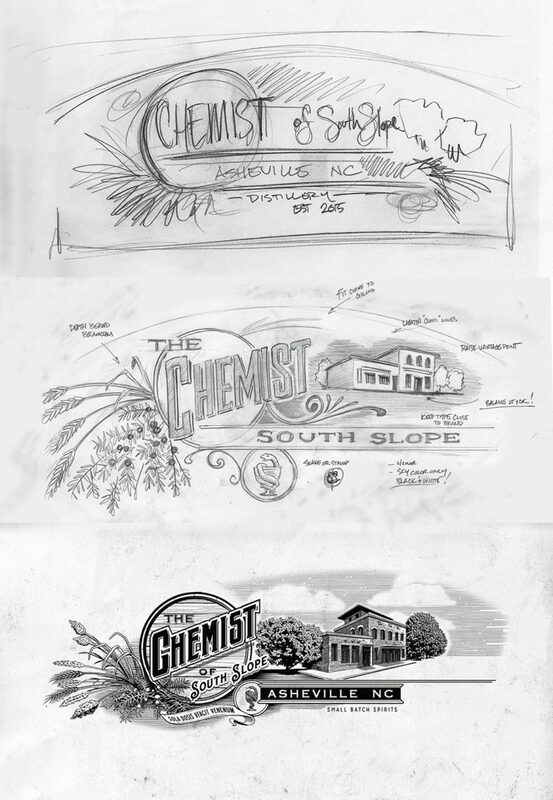 He drew up show posters for bands like Yonder Mountain String Band. 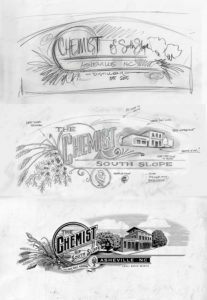 He’s drawn architectural renderings and still loves sketching old buildings and architectural highlights with a pencil. He designed labels for Asheville Pizza & Brewing’s Ninja Porter. Regarding the Brushcan mural work, Allred wants to be sure observers understand that was done in collaboration in Russell. “It’s a team effort,” he says. The Allred/Russell creations can be seen all over downtown Asheville. Examples include murals gracing City Transmission Service on Southside Avenue and Hunter Banks Fly Fishing on Montford Avenue, as well as in nooks along Rankin Avenue (Sweet Peas Hostel) and Walnut Street (Zambra), to name just a few. In all of it, Allred applies his trained eye as a graphic designer. 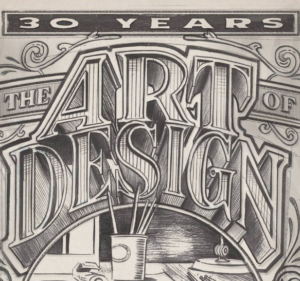 He credits his skill to the teachings of Roy R. Behrens, a distinguished writer and designer who has taught graphic design, illustration and design for half a century. Allred’s time at the Art Academy of Cincinnati coincided with Behrens’ tenure there. “He was so brilliant,” Allred says, still in awe of Behrens’ talent. The discerning eye Behrens instilled serves him well, Allred adds. That, in turn, serves those he works for, Allred says. At Allred’s show, a series of sketches and designs for a specific project will be shown side-by-side so the observer can get a sense of Allred’s process. It’s a remarkable display of hand-drawn work. Allred notes that Photoshop was just arriving during his college years, with many of his fellow students jumping at the chance to learn. “I wasn’t interested in all that. 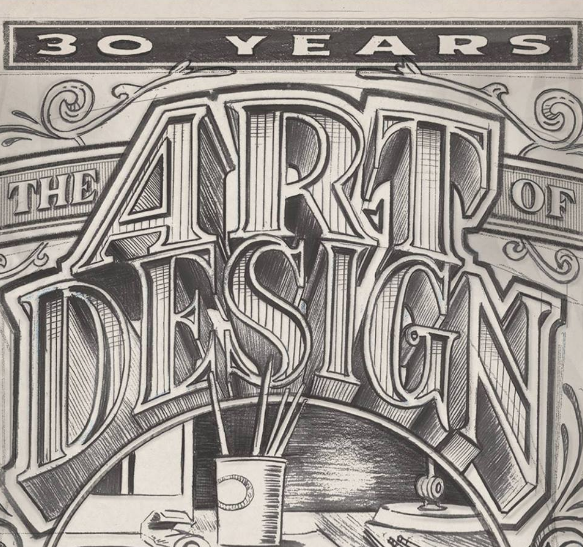 I was still studying typography and the history of design,” Allred says. His disdain of the computer certainly cost him many hours of drawing, he says. But what users gained in time, they lost some on the creative front, Allred says. “I’ll still start by hand,” he adds. Allred hopes folks will come out to the Saturday exhibition at Ramp Studios. He notes the popularity of time-lapse videos that he and Russell create of mural jobs, and says the show is similar. People will see firsthand what it takes to get from an initial idea to the final product, he says. “I think that will be interesting for people to come and see,” he says.